Featured in Aspire Magazine’s ‘Wisdom, Wonder, & Creativity​”​ issue. This morning I am looking out over the misty golden green hills from San Jose. I’ve been here many times, but never noticed the hills surrounding this city. My floor wasn’t high enough to see them? The buildings too big? I didn’t look up? How many things in our lives are like this? Many – we just don’t see it or pause or look up. Many years ago….I came to San Jose for my first corporate job interview, I took the train from SF in my navy blue suit, with the gold buttons, with anchors, white shirt, black heels. I was always wondering what color shoes to wear with that navy blue suit. I was 21. I got the job, I sold computer training for the first ever personal computers. I navigated my way through the corporate world for over a year. I was pleased as I just seemed to ‘know’ things. I would get asked questions or to do something I had never done, and I could do it. This is the job I left when I moved to the mountain, to Terra Sophia to study art. I never forgot the experience, and the training I received about business. I have been thinking so much about where I have been these past 26+ years as I approach my 47th birthday. From that corporate gig to the work I would end up doing all this time. We are here in San Jose, because last night we went to see Roger Waters, Pink Floyd, the RESIST TOUR. (if you are at all a fan, I would not miss this show). As I witnessed the wonder, and the mood, and the magic, and actually the love, despite the resistance message I had all these flashes about just how much Intentional Creativity is a part of our lives. From the Japanese Tea Ceremony to Pink Floyd, we have been creating with intention in most of what we do. So what’s different about the movement we are calling – the only real distinction is that we are have called it out – pulled the language out and said, this is intentional. We can create lots of things, not have them be intentional, and not receive the benefits we could be – by naming it, it changes how we experience it. This is truth. And it moves into all areas of our life, many call it mindfulness, but for me it has to do so MUCH with form, since I too, am form, it isn’t just thought, or thinking about thought, metacognition, but the actions connected to it in form – I talk about this in the article in ASPIRE MAGAZINE. A simple example is when I need to take a rest, but I am not tired enough to sleep, or I am worked up from excitement. So I lay down and ‘try’ to rest. Funny huh? So the distinction is when I say to myself – “whatever I am doing here, however I am feeling, this is resting” and I move my body into the resting shape and declare it resting, no matter what else might be going on, and, it works. At the concert last night I admit I was a little afeared about some of the images – as I am very impressionable – so I chose consciously to see it as the ‘freedom of the artist’ expressing – not that I needed to agree or disagree, but could honor the voice – and the children on the stage wearing RESIST tee-shirts. Yes. I am into resistance. Always have. So the experience I ended up with was a feeling of love. IT WAS AWESOME (and sometimes scary and political but they have always been so). He played tons of the old songs, looked amazing at over 70 and the experience was potent in many ways for me. Another thing that came up for me during the concert was how bold Roger Waters is to share his views and ideas – and how less bold I am. If I say one thing that triggers someone – like last letter writing about the fear of the US pulling out of the climate change agreement – I get feedback. Ok so I like it that we are not all the same, and I honor MANY views together at once – but right now it is so ‘charged’ that even if I don’t say something directly negative, just voicing fear, I upset people. I am trying to find my balance with this – speaking out and yet not alienating. 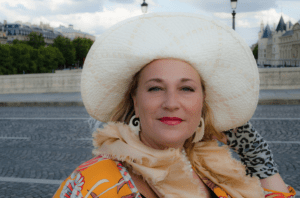 I lost lots of subscribers when I did the work on the Water Protectors – really? I know we can’t make everyone happy – and I am not trying to – but I find myself being afraid to speak – because I am here to encourage. It really made me wonder what I would say – if I was free to say what I wanted without fear of offending…? If I include Pink Floyd in this email will I get hate mail? Maybe. I am coming in with the Red Thread Letter to invite you to be more intentional about what you are doing – whatever it is. It isn’t just about art, but about perception and choice – how we interact with what there is. This ‘way of being’ isn’t new – our community is just focusing on it to bring our awareness to a space of awakening – as I don’t know about you – but being awake right now seems like just about one of the most important things we can do. So what have I been doing since my interview here 26 year ago? One thing: intentional creating. 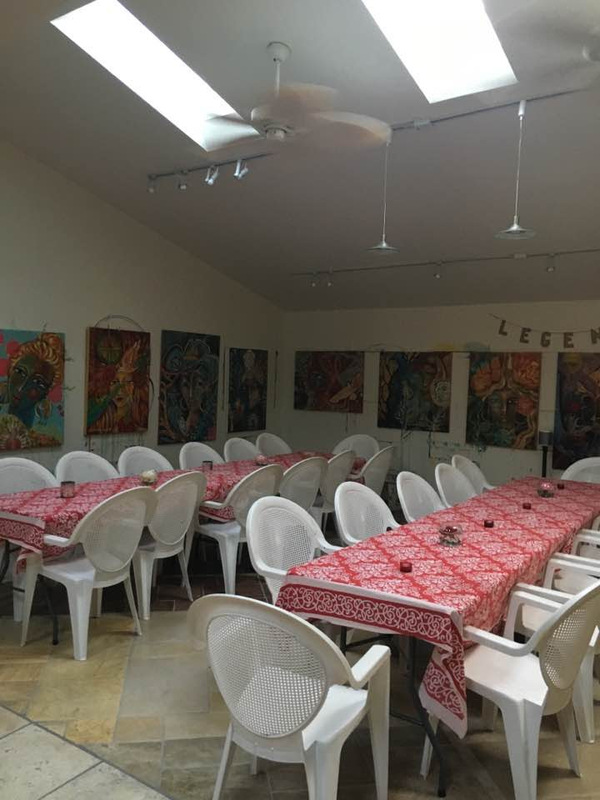 It feels almost strange to be old enough to have this perspective – that this one thing has taken all of my care, and interest, and how it intersects with community. 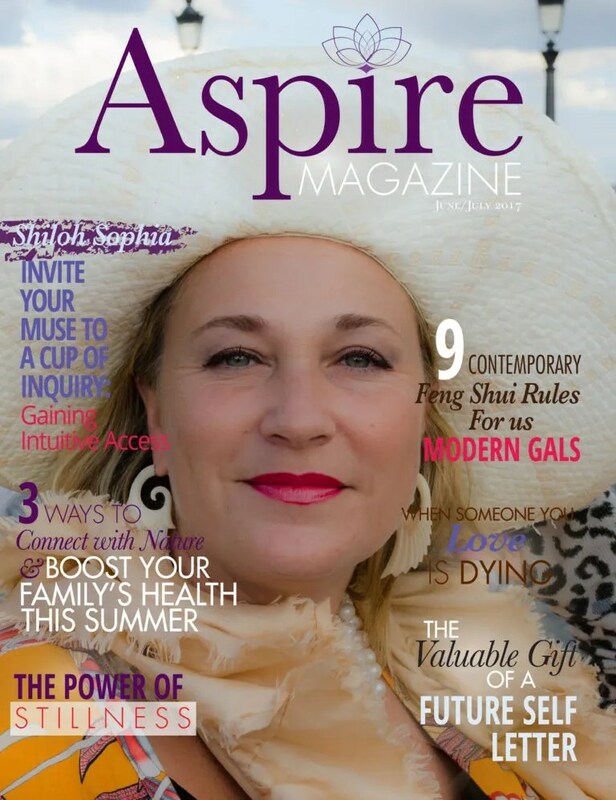 This month, I got to be the ‘cover girl’ for ASPIRE Magazine. They featured my book, Tea with the Midnight Muse in their top ten books in the last issue and then invited me to write an article about creativity. I did, which I thought was pretty heady on one hand, and yet so Muse infused on the other. I was pleased that Linda Joy, the publisher loved it, and then I got to be featured on the cover :0 I hope you enjoy the article, I truly would LOVE for you to read it. It sums up so much of the work I have been focusing on all this time about creating alternate spaces to explore in our consciousness. 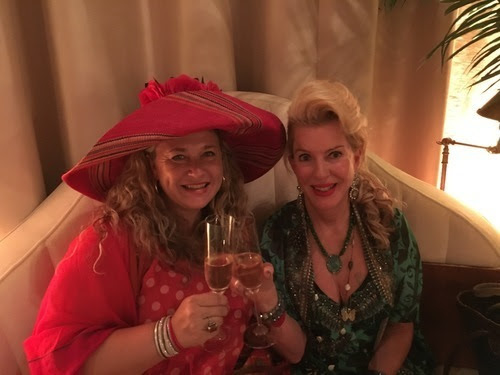 Last Saturday we had an INCREDIBLE evening with Gypsy Soul and a dinner party for 30 – our next Eccentric Supper Club is July 15 – save the date if you are in California. 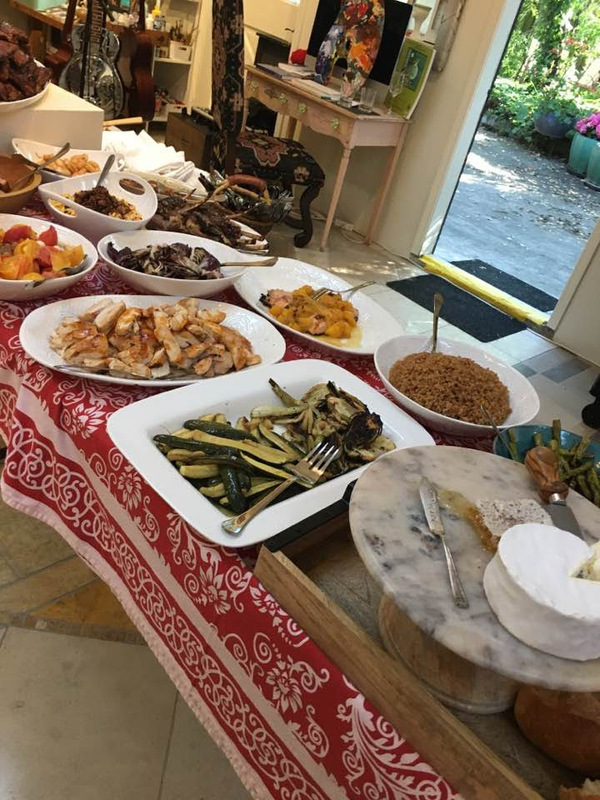 I love this picture – the moment of quiet before the people come and the lights go on….Jonathan made an incredible feast with veggies from our garden – and we were with friends old and new. For us, calling circles and classes and parties is part of our offering. One of the ways we serve and play. We provide an alternate space to renew and refresh – and yes, even reset ourselves. There is a lot to pray for right now – I have always watched world events, not as a political party participant, nor as a historian or spectator. I pay attention as an artist – this morning I have read about Comey, fear and mourning in the UK, and about a prostitution epidemic in Japan, where men seek girls under 18, in school girl uniforms – it’s a ‘thing’ there, cafe’s with girls in uniforms. There is craziness everywhere – and I do witness it – and my part is to provide a creative release – a way to self sooth and keep waking up – and to be in circle together. Encouragement for the journey. We each find our way to manage the energy – or the energy takes over…for you…I hope you are finding your ways – not of just coping – but of being with what there is while not losing yourself. Dear heart of hearts, wherever you are, whatever you are experiencing, I am being with you this moment, to consciously be where you are. To send my love through the field to you. If you pause a moment and let yourself feel it – perhaps it can reach you now. 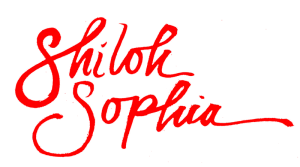 ← Invite Your Muse to a Cup of Inquiry, Shiloh’s Featured Article for Aspire Magazine!